Jama Connect encompasses a broad and deep product development lifecycle for true process coverage and transformation. Trace View enables live traceability across all your requirements, test cases, and items. Review the impact of a change before the change is made. Jama Connect automatically highlights the items and people that are impacted when a change occurs. Track relationships across projects with a visual schematic that shows the impact and reach of information across the organization. Jama Connect automatically marks items as “suspect” when they are downstream from a modified item. Review a running list of items that may need to be evaluated for impact. Give your Quality Assurance (QA) teams the ability to create and organize test plans, test cases, dashboards and reports to manage testing easily, in real time. Testers can view and run their test cases, and instantly log connected defects when tests fail. Execute, open or assign tests that directly associate with requirements and features. Build custom reports that provide the analysis you need for industry compliance while allowing you to see your data, your way. 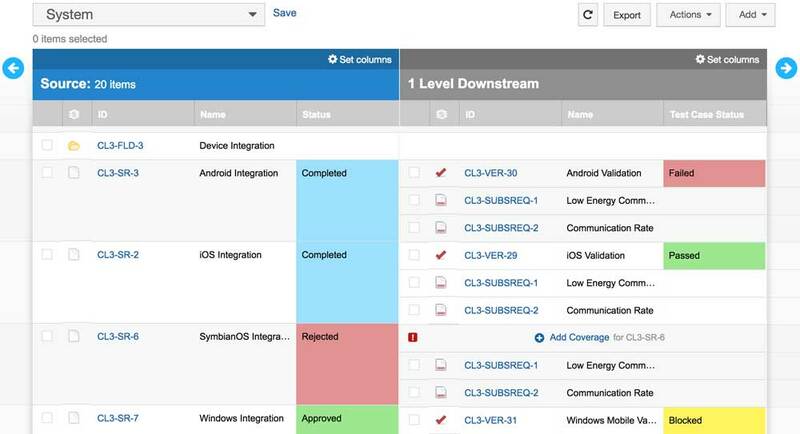 Easily show auditors the connections between regulations, requirements and tests, as well as related changes and discussions. Simplify the review and approval process by capturing feedback from stakeholders, including voting for priority and electronic signatures for approvals. Use Review Center to share product requirements among multiple teams for review and confirmation, confirm acceptance criteria, negotiate engineering responses, iterate on specifications and confirm agreed-upon requirements. Review Center allows you to gather and incorporate feedback from the relevant project stakeholders, track a review’s overall progress and view team statistics to determine which requirements have the most issues to address. Reviewers can respond to a conversation that’s taking place, as well as mark items “Approved” or “Needs More Work” to complete the review. Add electronic signatures to your reviews as a baseline for different phases of your development process or compliance purposes. Jama Connect captures the date and time of completed reviews for auditing, tying each signature along with a document to stakeholders or responsible individuals. Jama Connect encourages early and often collaboration and engagement. Shorten milestone phases, reduce development cycles, improve efficiency and help your teams identify risks and opportunities. Quickly get a pulse on a project without needing to know how to navigate all of Jama Connect. Stream discussions to bring new users and stakeholders into current conversations — seamlessly. Quickly see who authored, made an edit, commented or was mentioned on an item. See not only who is directly connected but also who is indirectly connected through related items, allowing you to illuminate changes to those who may be affected. 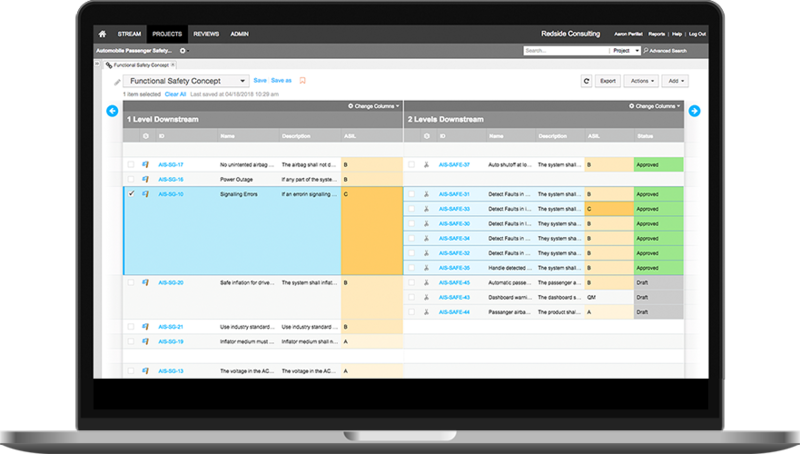 Jama Connect serves as the single, always-accessible database of your product IP, automatically keeping your data organized and secure across one project or multiple. 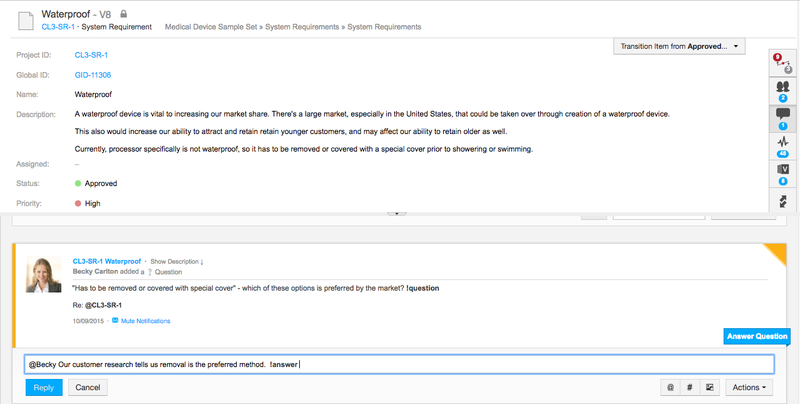 Create catalogs of reusable requirements to get your next product to market faster. Reuse keeps requirements in sync and in context across your organization. Take a “snapshot” that documents the current state of a project, or any subset of a project, at a given point in time — a baseline. Compare two versions of a requirement side by side and readily see what has changed, allowing your team to identify and work on the specific subsets that matter most. Start executing on your projects today with a free 30-day trial.